Sunday night (April 7) saw more than two hours of exciting, top quality guitar music, staged by Auckland Guitar School at the Uxbridge Theatre in Howick. 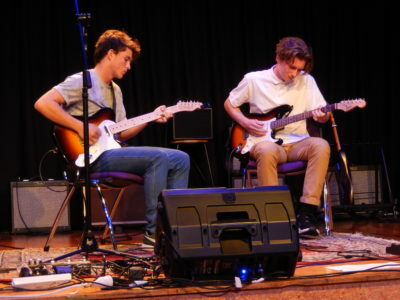 The Howick-based guitar school’s little Gig concert showcased a diverse range of performers playing everything from George Ezra and Ed Sheeran through to Pink Floyd and Cream. The set also boasted a number of original songs performed and sung by their composers. In all, it was an exceptionally professional and entertaining show with some stunning performances played to a sold-out audience. As owner/teacher Dylan Kay explains: “These concerts are incredible experiences for the performers, and it’s great to be able to have them entertain an audience like this and show them what they can do. “Our annual Big Gigs have become an important feature of student life at the school and we were very excited to be able to bring a stripped-down version to our favourite local venue. We’re very proud of the quality of all our students and we’ll be doing this again! Auckland Guitar School is Auckland’s biggest specialist guitar school, teaching kids and adults, from total beginners through to advanced level.